Yesterday we sped from one town to the next to ring in the towers of many churches. We visited Father Roman’s alma mater, Saint Sergius Lavra, which is kind of like the Harvard of seminaries One chapel held the remains of Saint Sergius himself (the patron saint of Russia), and another had bells on top that you could only reach by a ladder that was precariously propped against the side of the building. I’ll get to that ladder in a bit. Bell tower at Saint Sergius Lavra. But first we got inside the enormous bell tower in the center of the complex. It was the tallest structure by far. This tower has the largest hung bell in Russia (72 tons, which has to be rung by 5 or 6 people), and the oldest (cast in 1420). 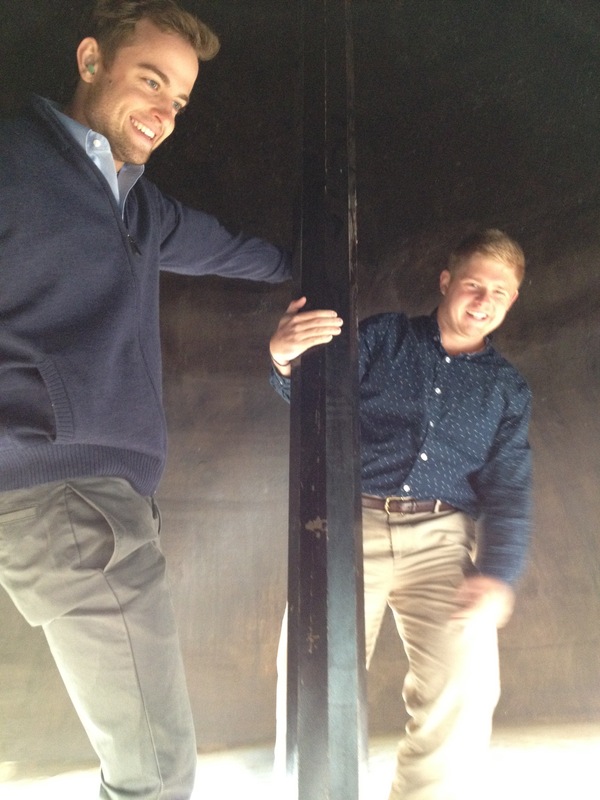 Harry and Todd standing on the clapper of the largest bell in Russia. 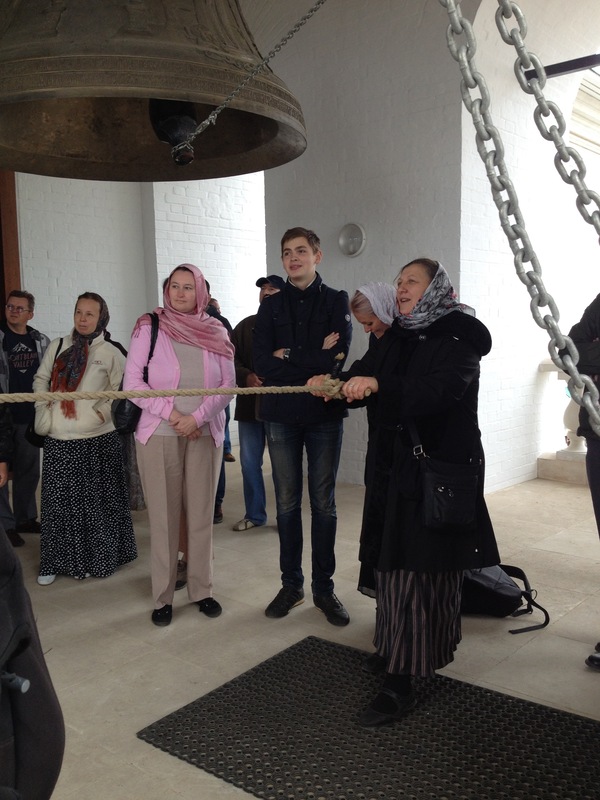 We saw the head bellringer ring the impressive St. Sergius Lavra peal, which involves a tricky wrist movement that allows you to ring four bells in descending order very quickly (called “the circle trill”). 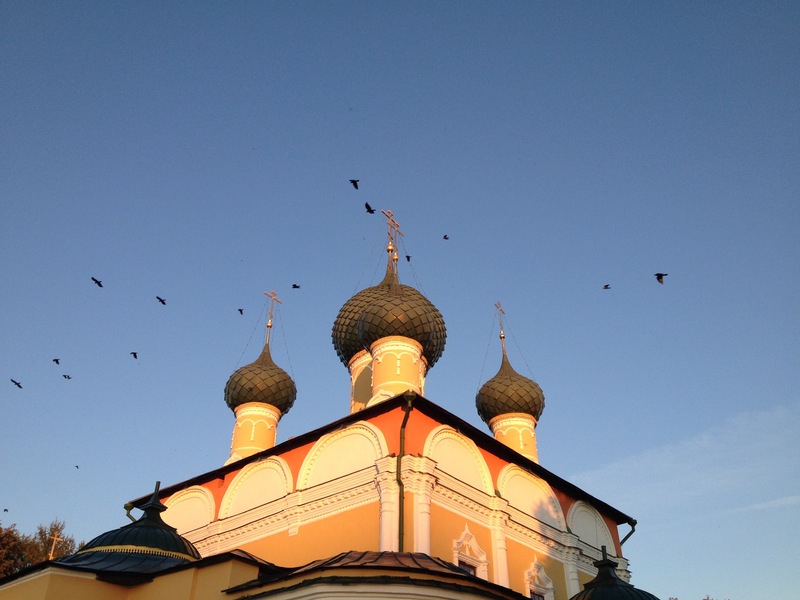 Saint Sergius Lavra on Vimeo. Smaller chapel at St. Sergius Lavra with bells only accessible by roof. While this peal was being performed, Father Roman swept from the tower and a minute later we could see his miniscule form making its way to the smaller chapel across the square. He climbed up the ladder and then used a rope to walk up the roof until he got to the bell tower. At a certain point, the head bellringer stopped his peal and rang three times to signal Father Roman, who then rang his own peal and sent the signal back to our tower. It was like watching a synchronized dance between two gigantic, stationary towers. At around 3 pm, we pulled into Rostov Velikiy (Rostov the Great), an ancient and sleepy village on the shores of steely-gray Lake Nero. 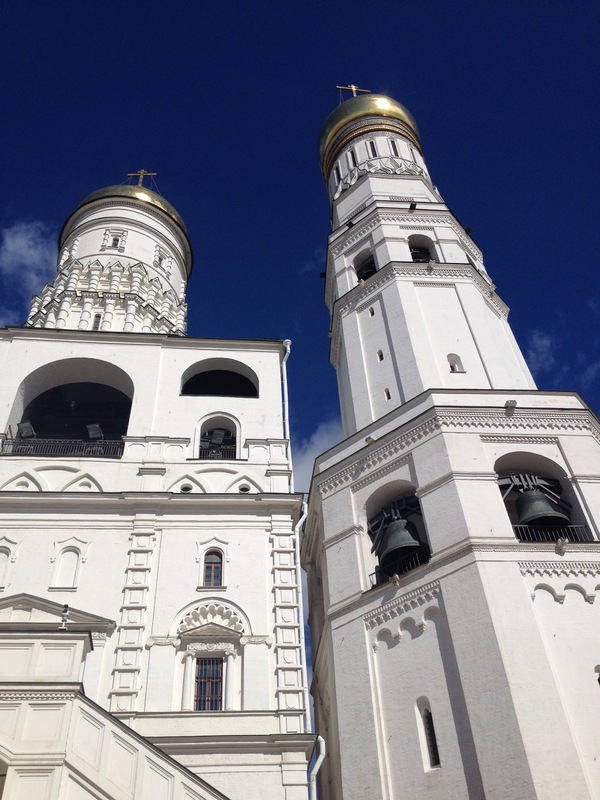 Rostov boasts several churches, a recently restored and fortified kremlin, and one of the most beautiful and historically significant sets of bells in the land. The Danilov bells were of course preserved at Harvard, but the Rostov bells were intentionally spared the Bolshevik purges for their cultural cachet. The Rostov belfry dates back in its current form to the 17th century. Its architecture is striking and unique, with a gallery of white-bricked arches displaying a row of bells. The openness of the gallery design, where ringers can see each other as they ring, allowed Rostov zvonary to pioneer the coordinated, rhythmic bellringing style we use today. We were lucky enough to see a demonstration of the traditional peals, which you can listen to a bit of by clicking below. As you can hear, the two largest bells, many times larger than our own Mother Earth, ring out with striking synchronization. 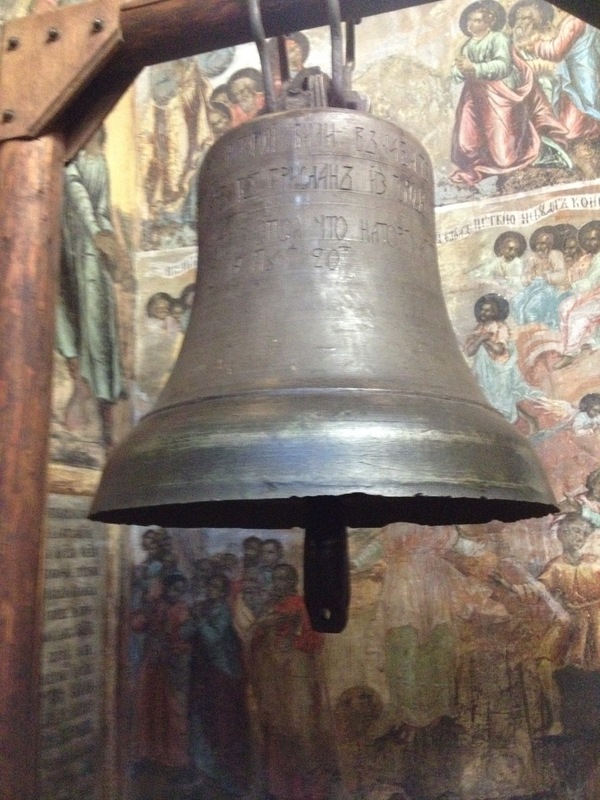 The largest bell—Sysoy—was named after the father of the Metropolitan whose seat was at Rostov. Impressive coordination of bellringers at Rostov. 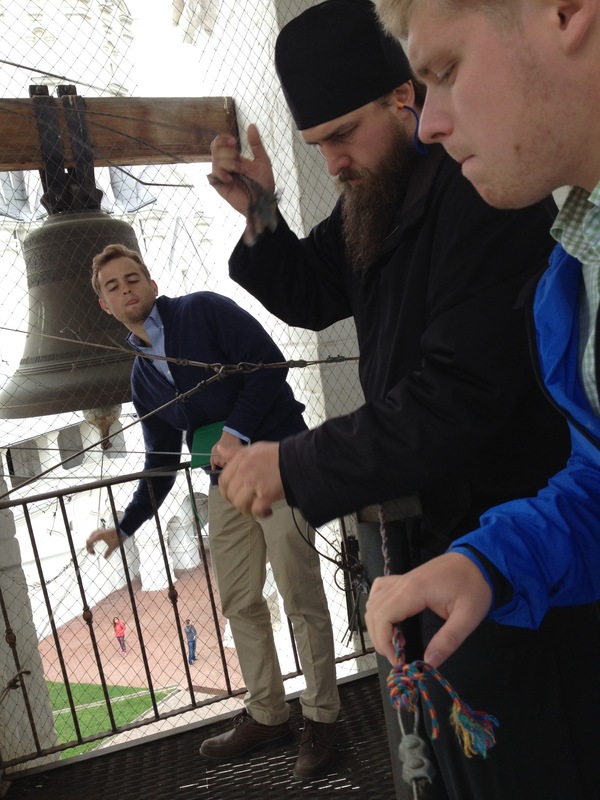 The second-largest bell was rung by a very serious young man with a funny hat. The bell did not have a rope on its clapper, which required him to lean back and forth holding the cast-iron monster in a manner that demanded a great deal of skill, but also called to mind certain of the artistic stylings of one Dr. Seuss. 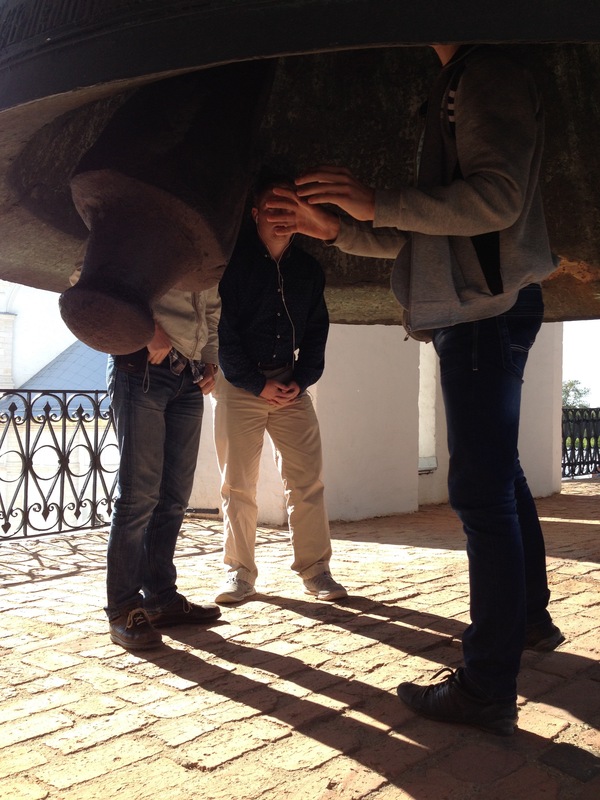 Ringing a Rostov bell without a clapper. We weren’t allowed to ring the historical set, but through a gate and across a courtyard lay a treat: a small tower with some of the sweetest-sounding shiny-new trill bells we’ve found. Looking out across the waves of Lake Nero, we saw a bell tower with its own story. Allegedly, in centuries past, it was illegal to build a tower taller than the Ivan the Great bell tower in the Kremlin. The tower we saw broke this rule, but when the Tsaritsa sent an inspector to verify the tower’s height, villagers built mounds of dirt around the tower’s base. This obscured its first story, creating an appearance of shortness, and the tower survived. After a delicious snack, we piled back into the van with Igor, the other Russian bellringers in tow. Tea, breads, and fruits at Rostov with our bellringing friends. We bid goodbye to the sleepy sunlit courtyards with their lush grass, and the technical skill of the 4-man bellringing team. 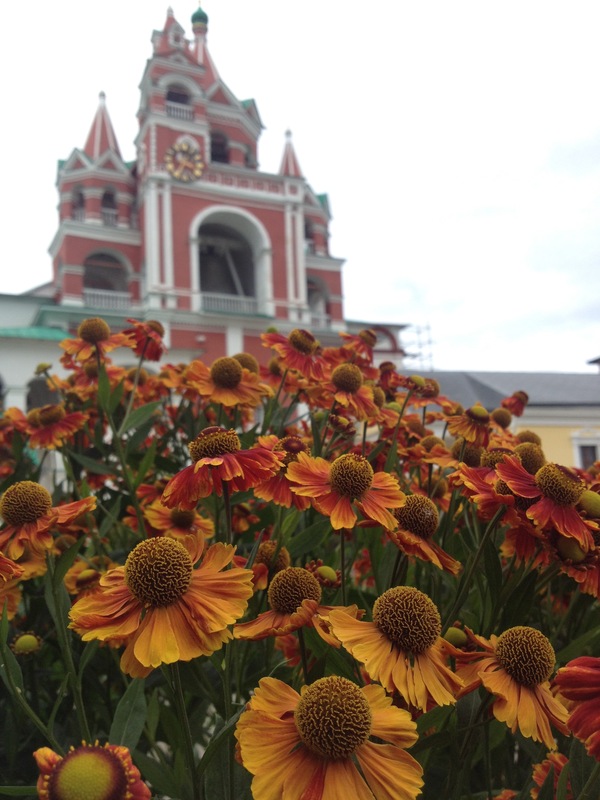 We were in for more sunlight on more grass in Uglich, but this town and its bell also held a darker story. Uglich is a quiet town on the banks of the Volga river. “Uglich” actually means “corner” in Russian, and the town happens to be positioned on the corner of this great river. It was late afternoon when the van crawled to a stop in front of the Church of Saint Dmitri on Blood (quite a name for a tiny pink church). 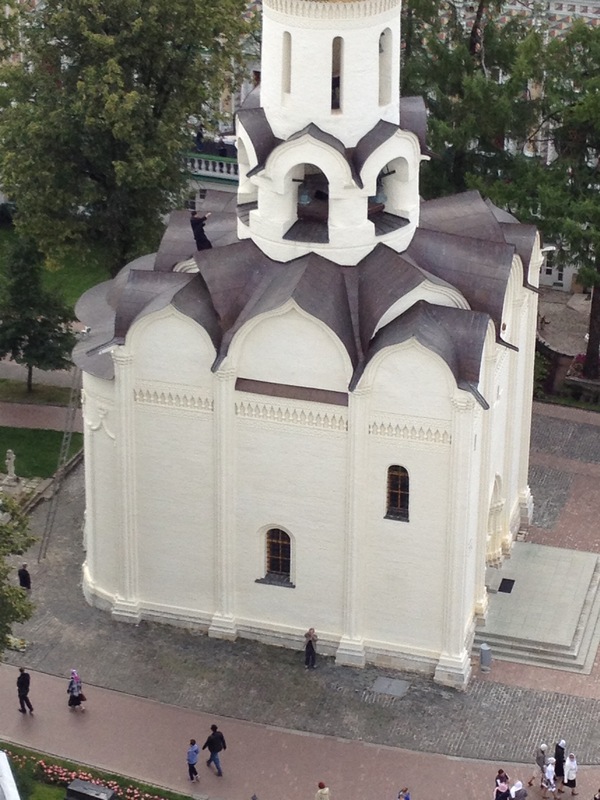 Church of Saint Daniel on Blood in Uglich. The sun was a spectacular buttery yellow, and every so often a flock of crows (“vorona,” in Russian) swooped from one set of birch trees to the next. Their squawking black forms looked like the poppy seed crumbs we keep leaving on tables after eating Russian “crispies,” scattered as if from a hungry mouth. Inside the church we were able to see the ancient alarm bell of Uglich, an unassuming dark bell hanging from a wooden beam. In 1591, Boris Gudonov murdered Ivan the Terrible’s youngest son, Tsarovich Dmitri in one of the Tsar estates in Uglich. Though Gudonov claimed that the young boy had a seizure and fell on his own knife, the Uglich bell was rung to alert the town to the murder. The townspeople gathered en masse and killed the killers. Enraged at the crime, they then proceeded to throw the traitorous bell from the tower, rip off a few of its ears and tear its tongue from its shoulder. They whipped the bell and then exiled it to Siberia, where it remained until the 19th century. Now it hangs, meek and abused, in the Church of Saint Dmitri on Blood. Uglich exiled, abused, and returned bell. 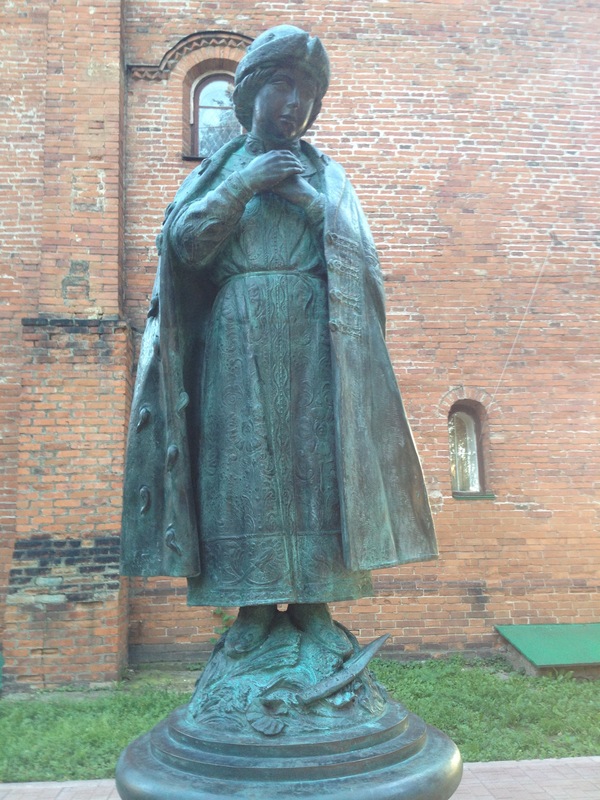 Statue of the murdered Tsarovich Dmitri. Despite its terrifying tale, Father Roman pointed out that it has a very pure, beautiful sound. Mulling this incongruity over in our minds, we returned to the banks of the river. The sun was setting (or “seating itself,” as it is phrased in Russian) and it was time to bid goodbye to our bell-ringer friends. We are so thankful to have had so much time learning peals and Russian words. What a kind, talented group of people! We will dearly miss them. Monday was a day of excursion for us! 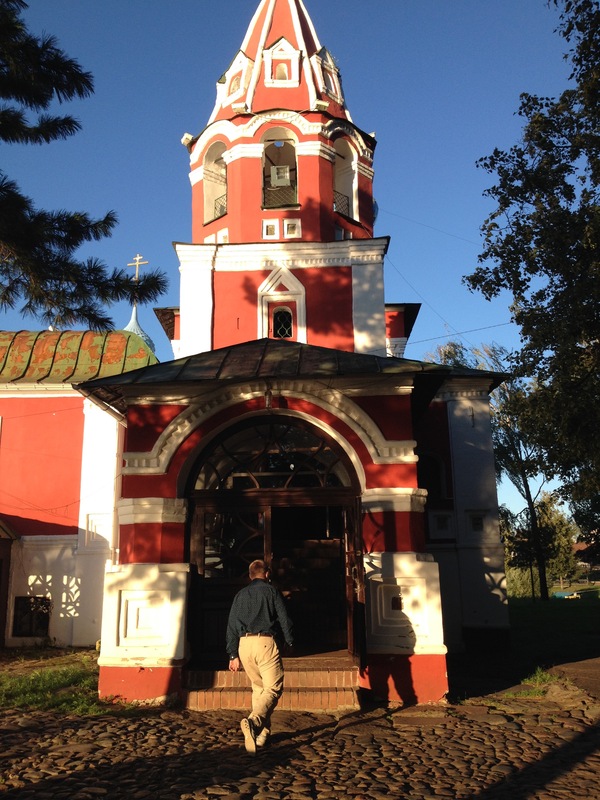 We drove to Zvenigorod (translated as “city of bells”) with bell ringers from the Danilov monastery. Our first church stop was at the Church of New Jerusalem, which is currently under restoration. 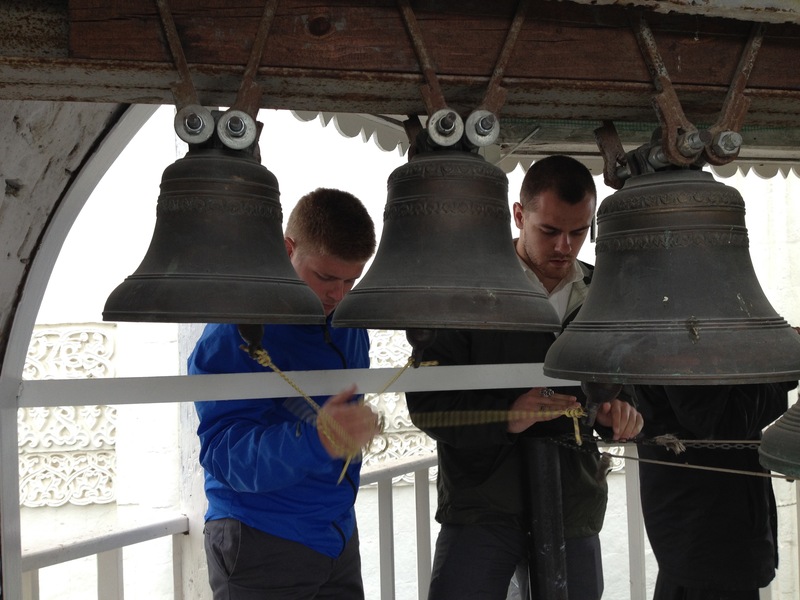 We were able to ring a new set of bells, cast about two years ago, as well as an ancient bell which was cast in 1666. 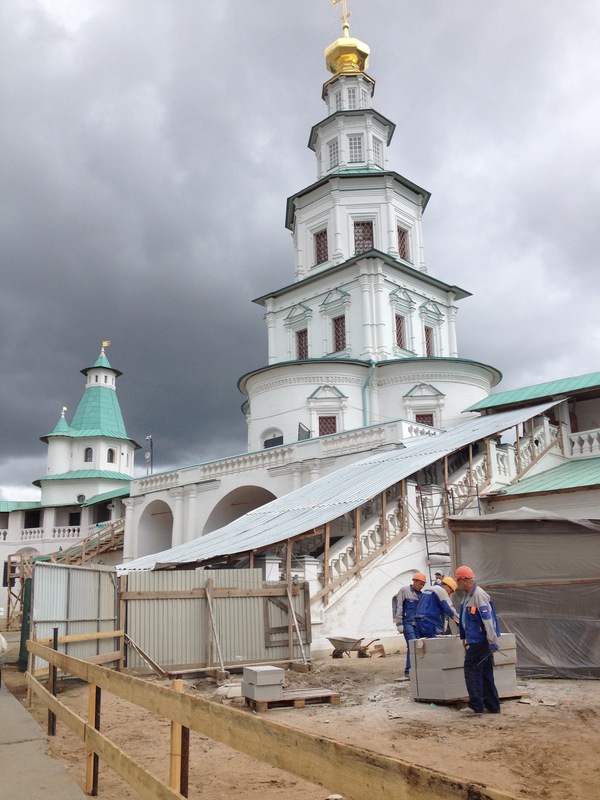 Church of New Jerusalem under renovation outside Moscow. Pulling the rope to ring the ancient bell. The head bell ringer played a unique peal, which he told us was inspired by Led Zeppelin’s guitar solo! 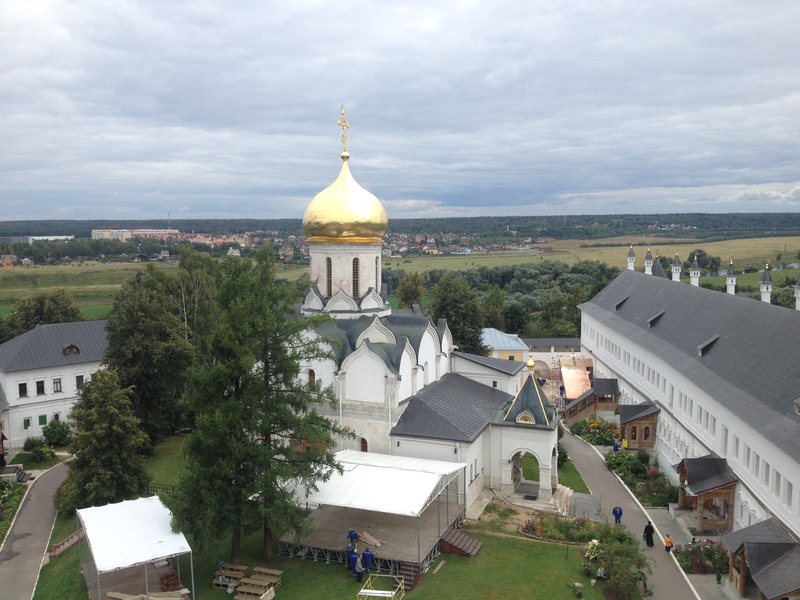 From there we traveled to Zvenigorod and visited a very small church that was built by the soil embankments of a very old city. 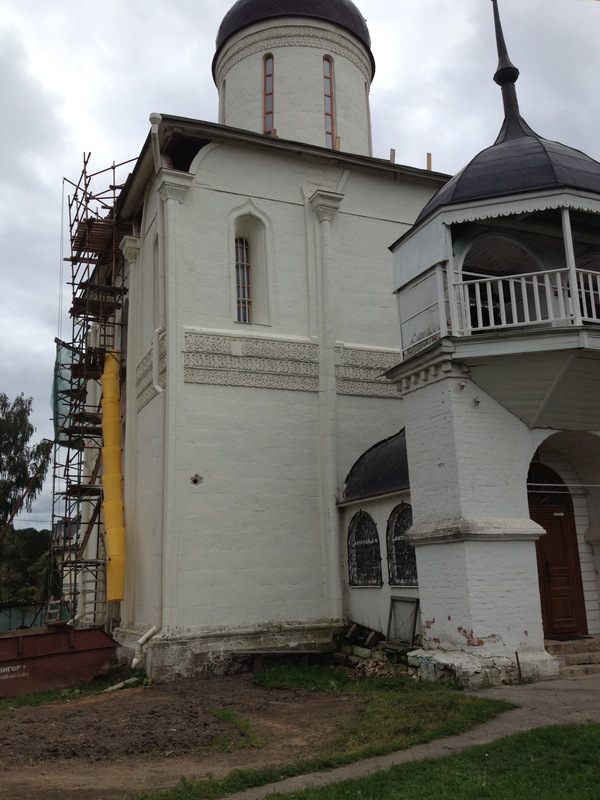 This church is the oldest in the Moscow region and was also under renovation. 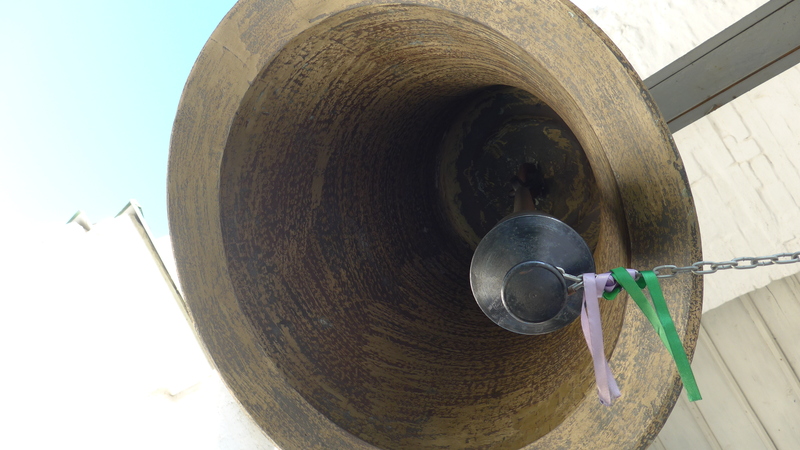 We met the head bell ringer who has been living and serving at this church for 32 years. He kindly let us climb up the smallest staircase we had encountered thus far to the bell tower. 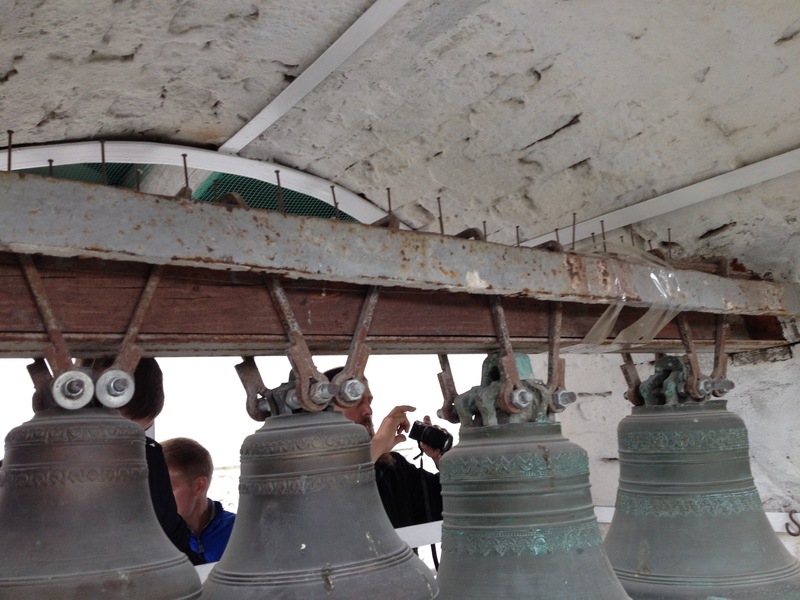 There we played quite old bells, cast in the 17th and 18th centuries. The setup was simple–only eight bells–but the view of the garden and fruit trees below was really charming. St. Savva church and bell tower. View of St. Savva monastery. Harry and Aaron playing trills at Zvenigorod church. Zvenigorod church and bell tower. It is the oldest in the Moscow region. Some bells cast in the 16th and 17th century hang in Zvenigorod church. Ringing for 5 o’clock from the base of the bell tower. 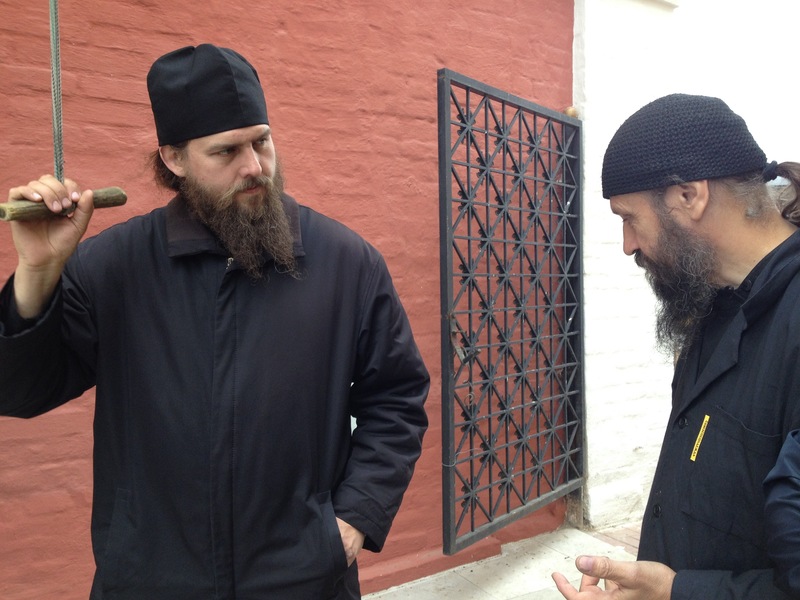 Next stop was St. Savva Storozhevsky monastery whose enormous bell features at the beginning of this post. 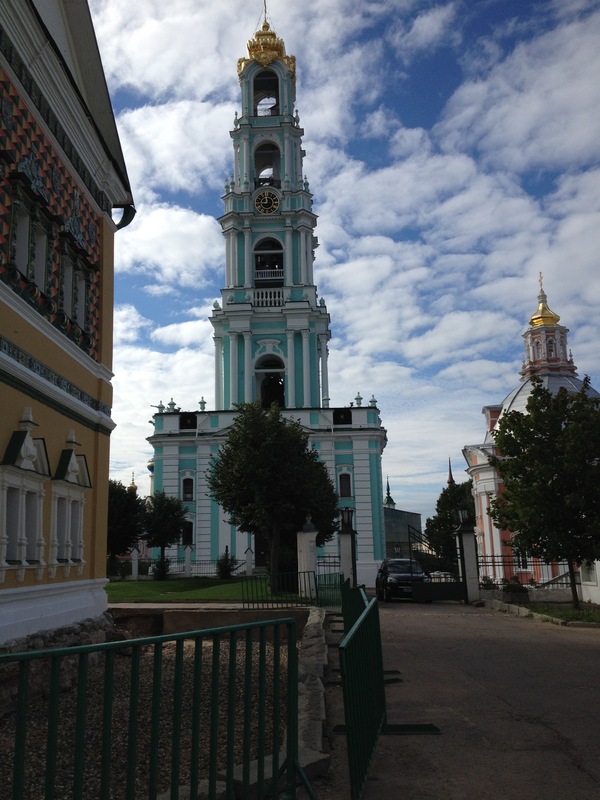 Once the country home of Tsar Alexi, the monastery dates back to the 15th century, and this bell tower to 1650. We could survey much of the dark-green countryside from the tower, and when 5 o’clock came around, we gathered at the bottom of the tower so that Father Roman could ring one of the bells by pulling a very long rope attached to its clapper. Today we visited another former country home of a Tsar. 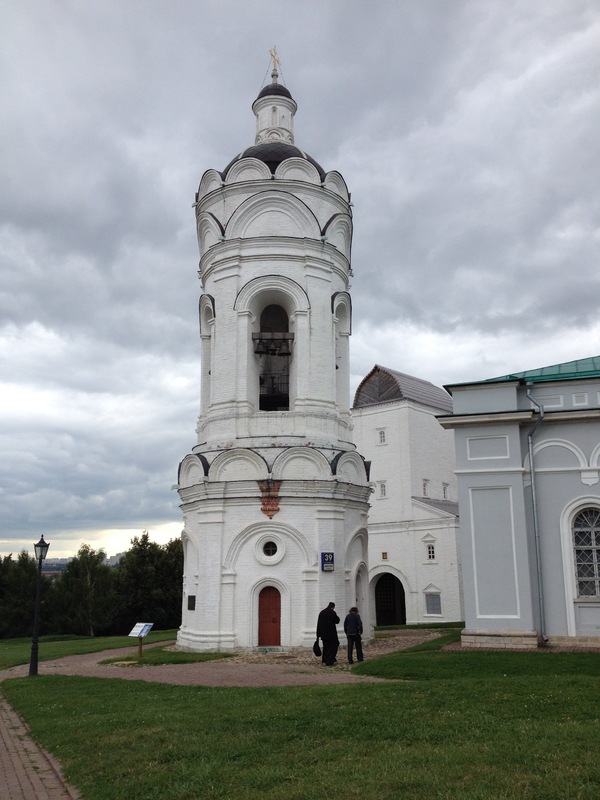 Ivan the Terrible grew up in the grounds of Kolomenskoye park, which, lucky for us, has a pretty incredible bell tower. Todd, Father Roman, and Harry ring inside the Kolomenskoye tower. At Kolomenskoye we tried again to play the Welcome peal, and we think it worked a bit better this time. Take a listen! Sadly, today was our last day at the Danilov monastery. 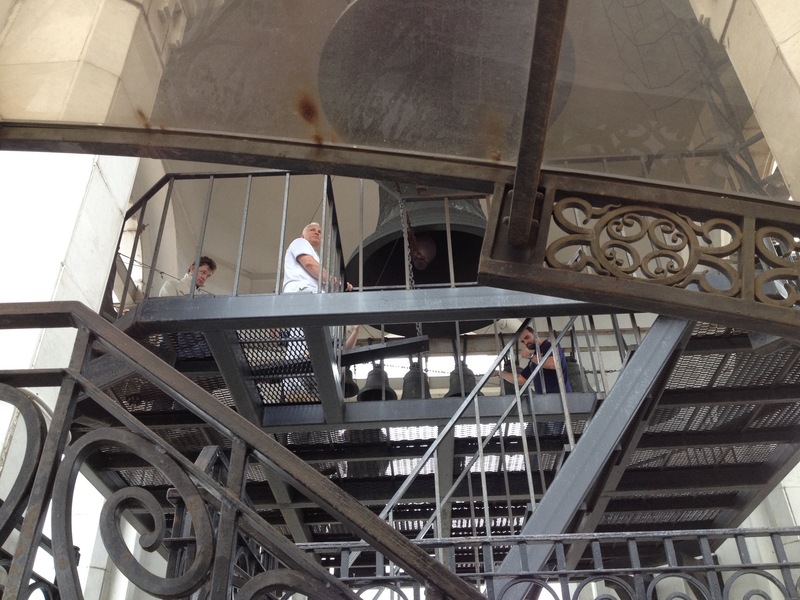 We gathered with our fellow bell ringers to take pictures in the tower, and ring during the evening service. 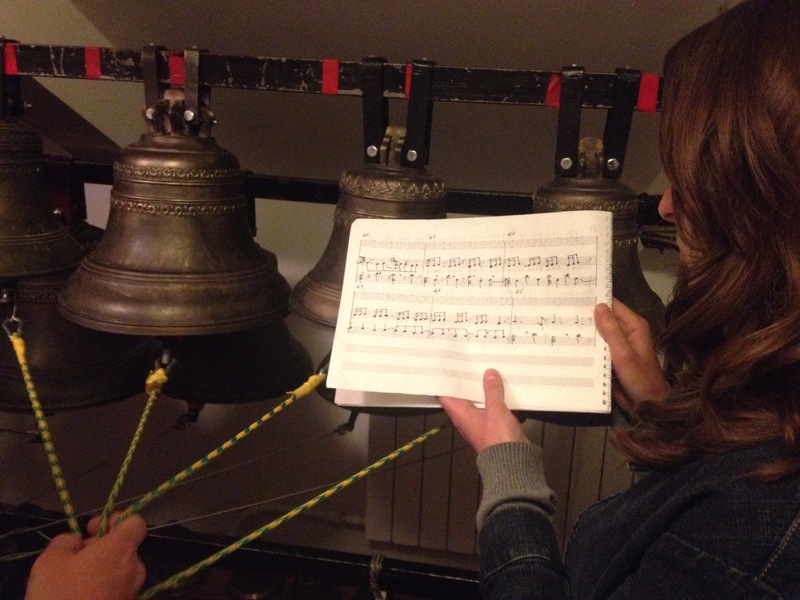 Thanks to the expertise of the other bell ringers, we were able to cobble together a Rachmaninoff-inspired peal. Rachmaninoff imitated the sounds of Russian church bells in one of his compositions, and from this score it is possible to recreate the peal he might have heard. It’s a double transliteration (bells to piano to bells), but it’s perhaps one of the best records of peals from the 19th century. We will miss Danilov monastery. Thanks to all the people who made our stay here truly memorable and enjoyable! Mother Earth in the Danilov bell tower at night. 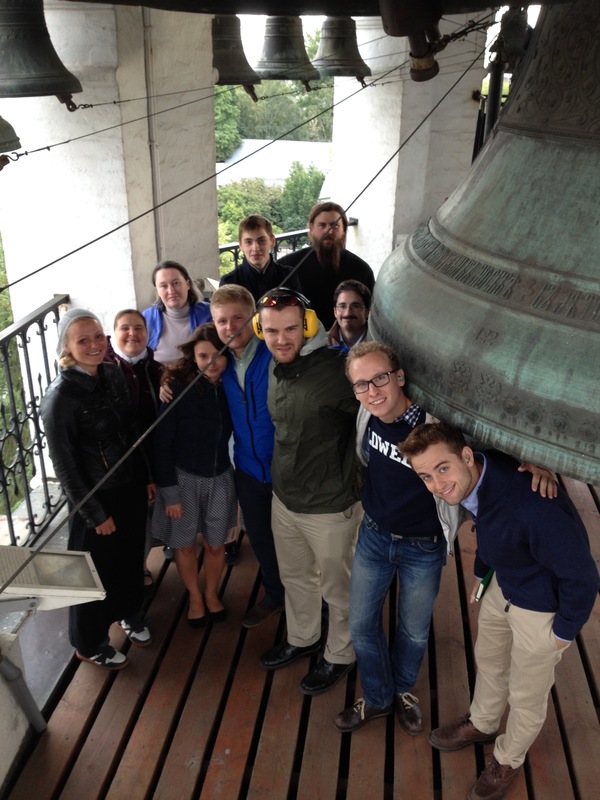 Danilov and Harvard bell ringers all together. Can you spot the dogs? 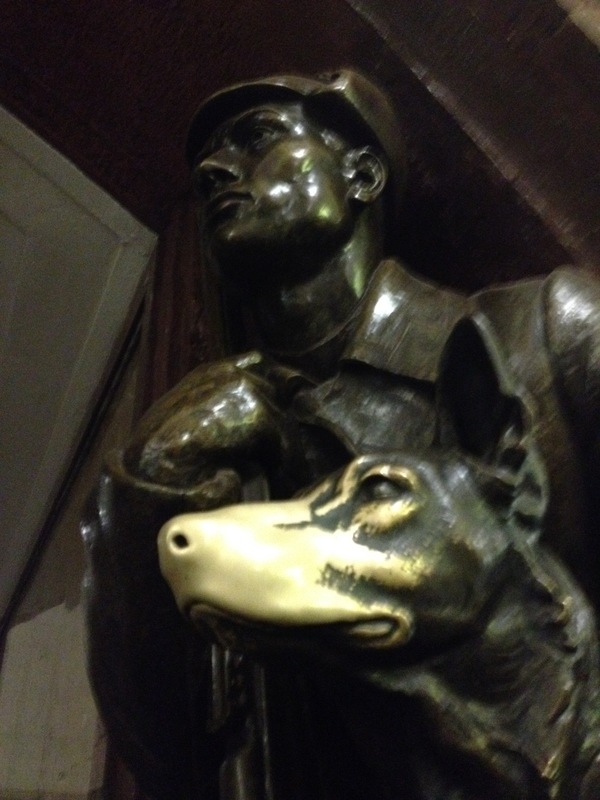 Statue in a metro station underneath MoscowCan you spot the dogs? 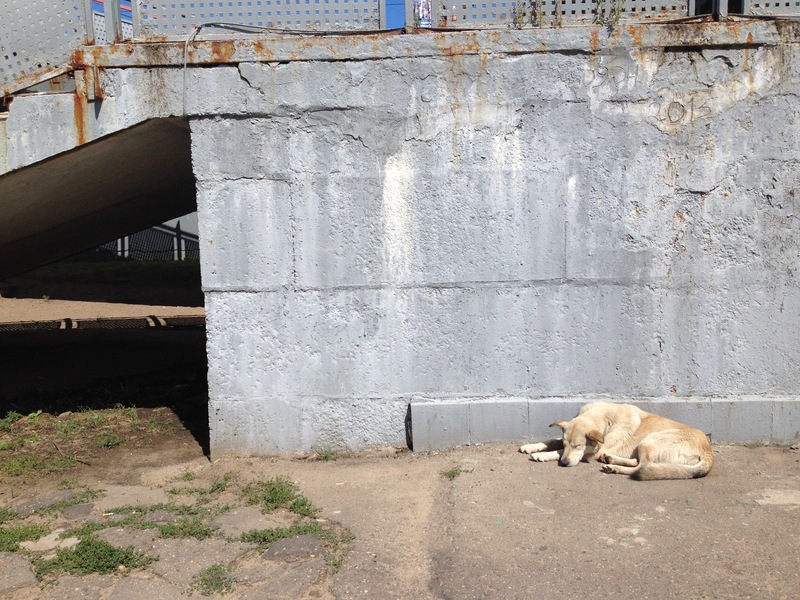 A dog snoozing by the Letecks foundry. 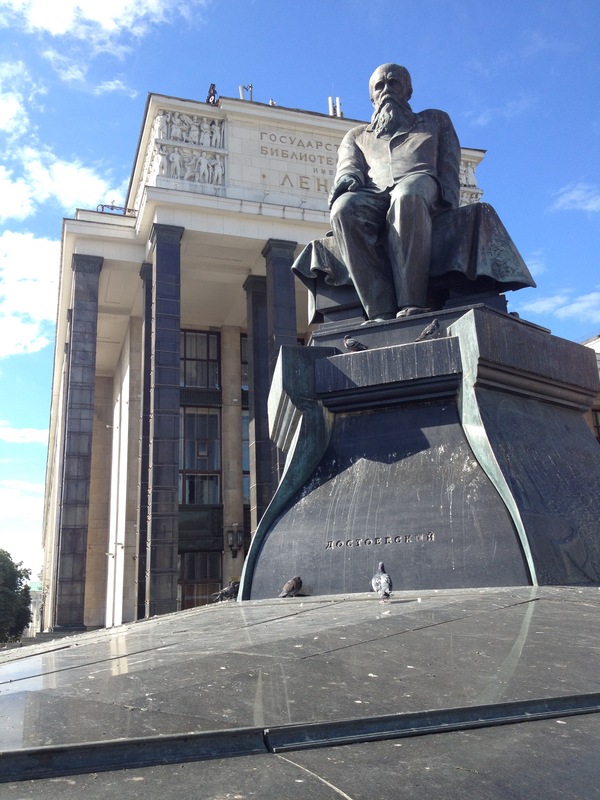 Dostoevsky in front of Lenin Library. 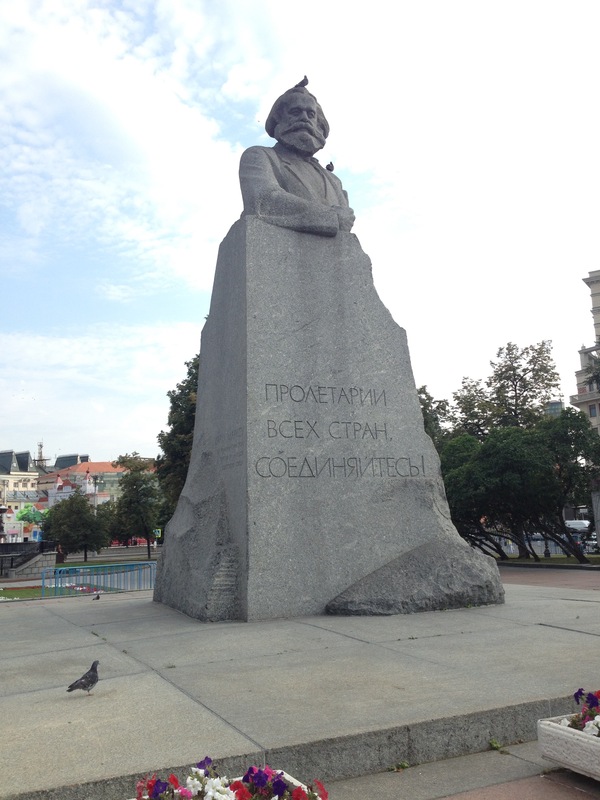 Karl Marx in front of the Bolshoi theater. Three views of one bell tower: Ivan the Great at the Kremlin. 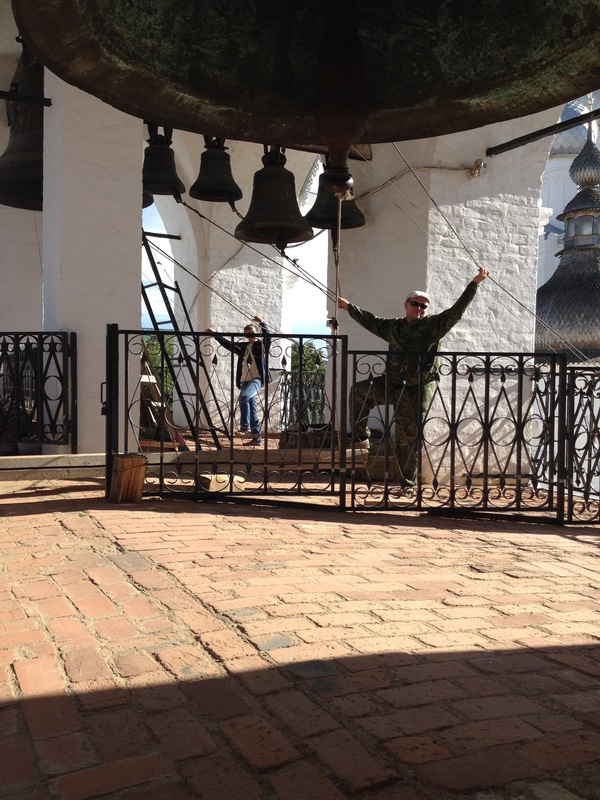 A bell at Michael Archangel church outside of Moscow. 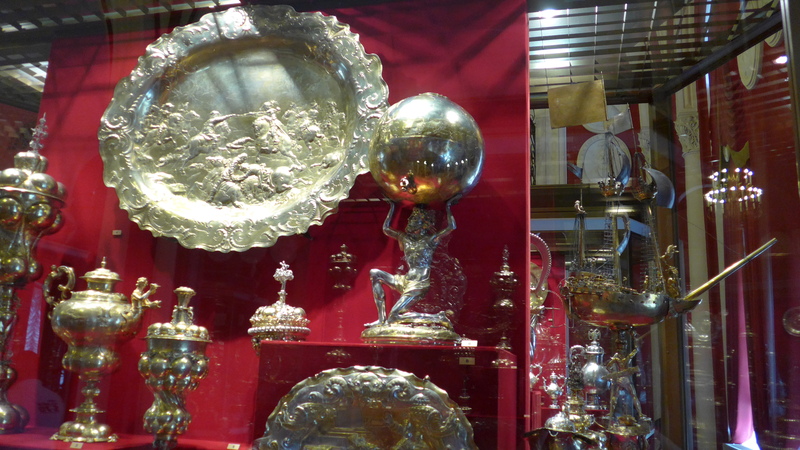 Drinking flasks and cups from centuries past at the Kremlins armory. A martini dispenser at a Moscow restaurant. An insect lair, or bell tower? Bells at Christ our Savior church. After all this seeing and walking and doing, we still managed to learn one more peal by the end of the day! 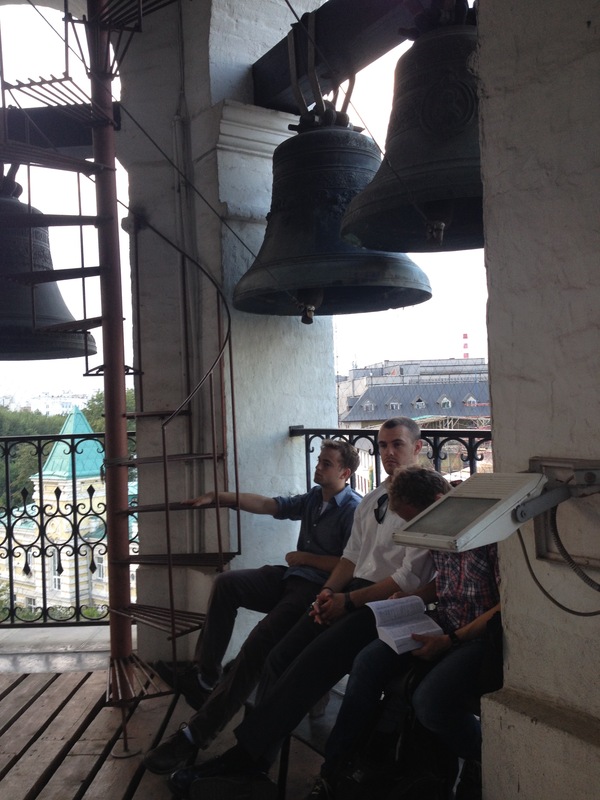 Here we are, on the chime-like practice bells at the Danilov monastery. We are learning to play the Pskov peal, named after a city with an ancient style of bell ringing, where ringers stand on the ground and pull long ropes attached to clappers of bells up in the tower. 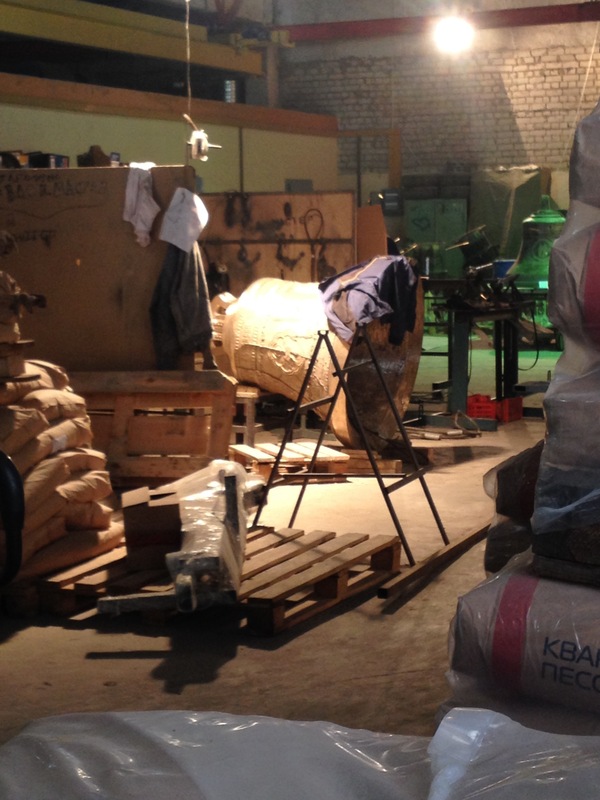 Today we traveled to the Letecks Bell Foundry about an hour southeast of Moscow. It was an incredible facility, way out amidst tall birch and pine trees. Overhead an airplane show tore open the sky–complete with barrel roles and loop-de-loops–while below, bells were being born. Below you can read about the process in six steps accompanied by pictures. This doesn’t capture all of the burning, molten smells, piercing machinery sounds, and golden sand dust in the air, but it’s the best we could do for now. So, enjoy! 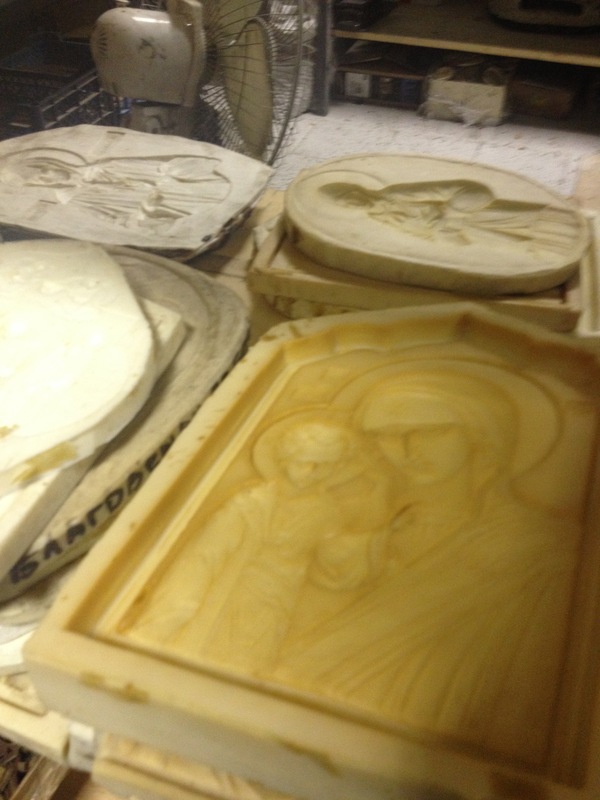 After carving plastic models of icons, artisans create these silicon molds. 2. 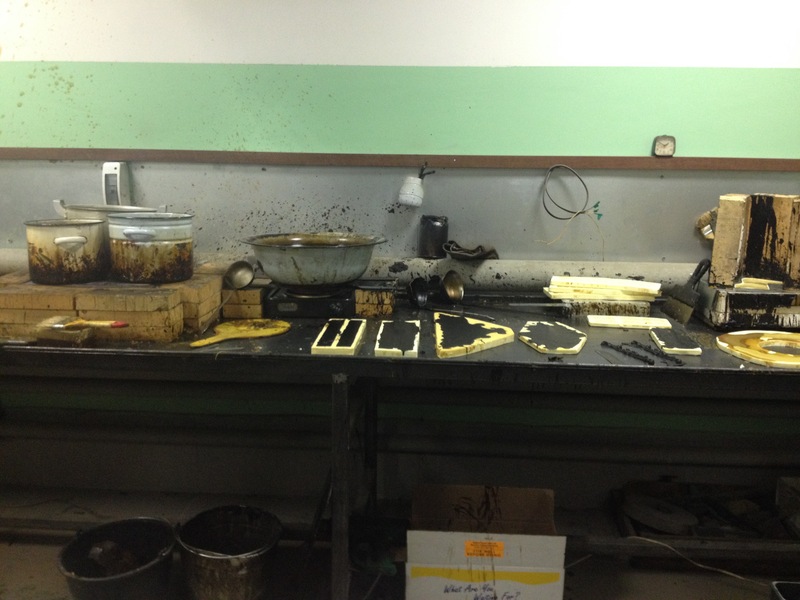 Next, workers pour hot, heavy duty wax into the molds and wait for them to set. 3. 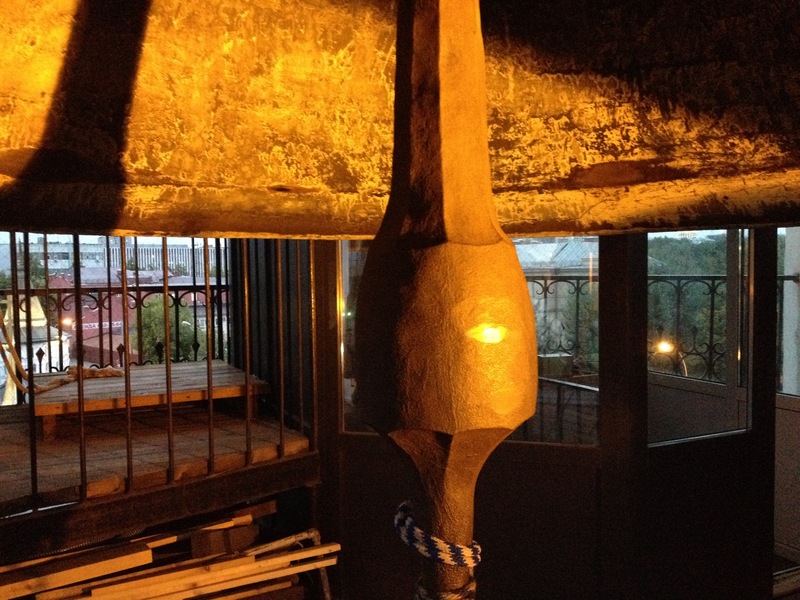 After the decorations are dry, they are attached to the surface of these metal replicas of different sized bells. Their placement must be precise so as not to interfere with the eventual tones and vibrations of each bell when it is struck. 4. Artisans create an mold of the inner shape of the bell out of ceramic. 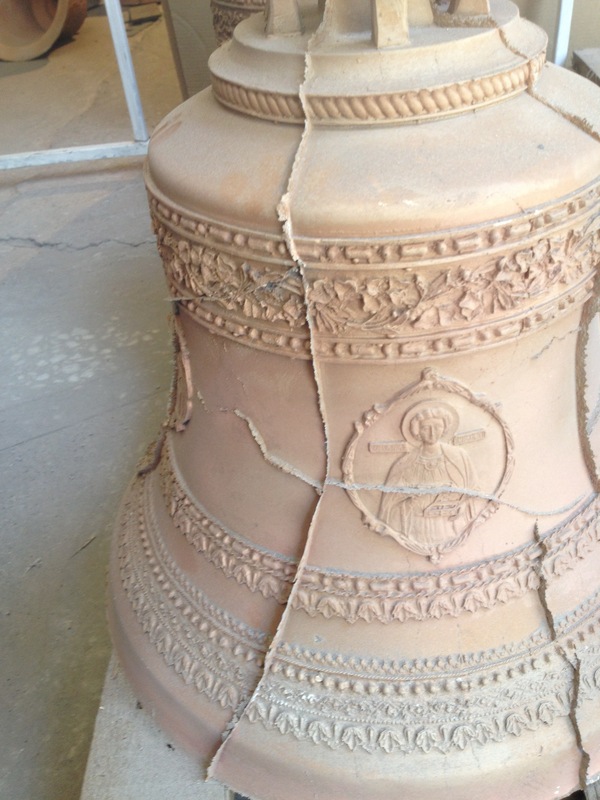 Composed of very fine sand, this ceramic inside is quite precise. Another mold is created for the outside of the bell, with the negatives of the decorated models in the previous picture. 5. 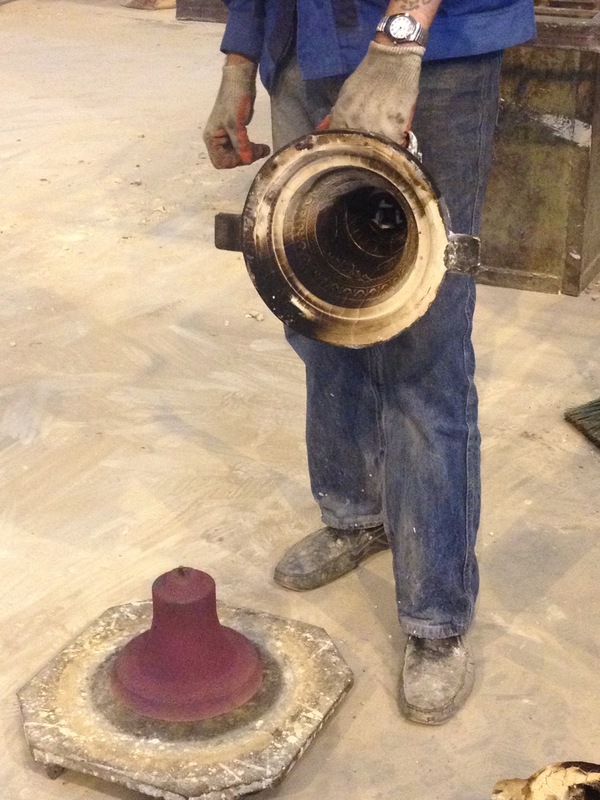 With the mold all done, the material of the bell must be mixed and melted. 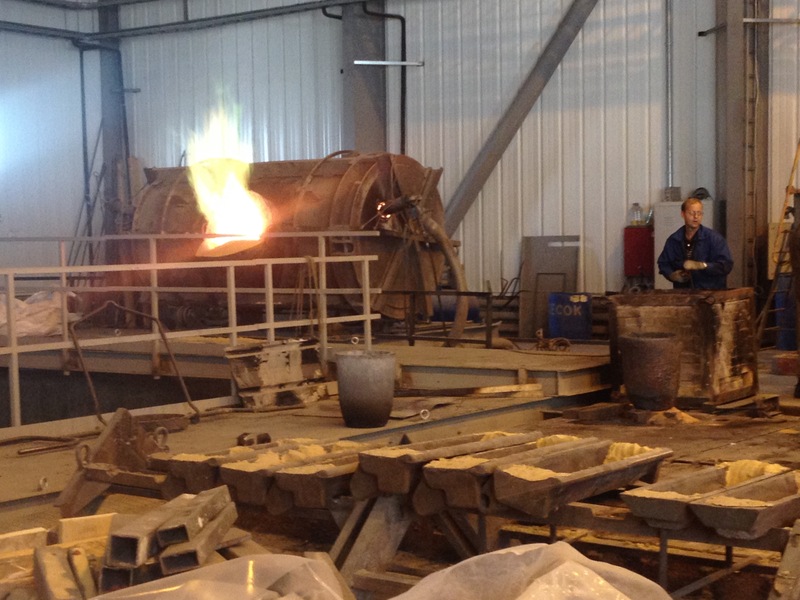 Metal workers throw bars of copper, tin, into the flaming container of metal goop pictured here. Occasionally a worker stirs the molten metal with a wooden stick, half of which catches on fire when in contact with the molten metal. This is done to aerate the liquid. From there, workers lift the container with cranes and pour the glowing soup into the bell molds. This requires many pairs of hands–one to control the crane, another to position the container above the molds, one to turn the crank that pours the human-sized cup, and one to scrape back impurities in the metal. As we watched, liquid gold slopped into the vessels like syrup, making gulping sounds as it hit the bottom of the mold. 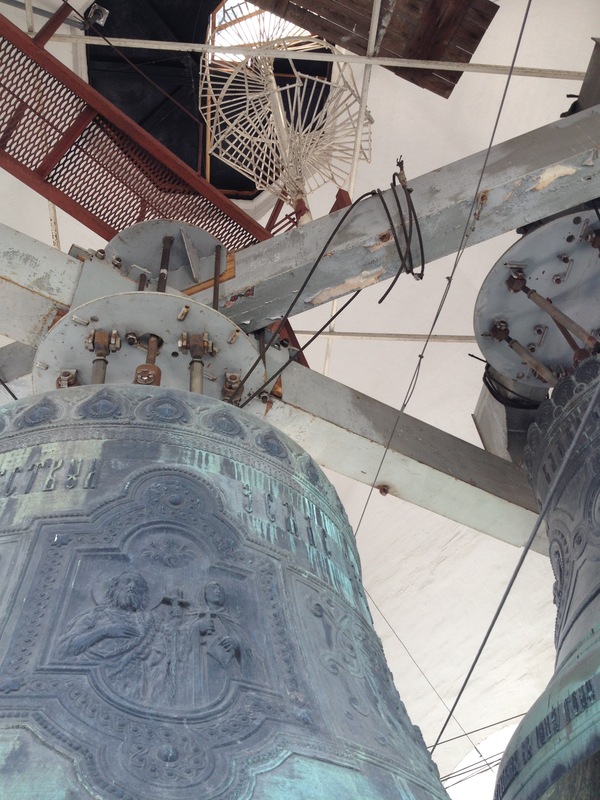 When the bells drank up their last bit of metal, the sound created by liquid splashing into the mold increased in pitch, just as the pitch of water filling a bottle with a tapered neck will arpeggiate upwards. After the bells were topped off, flames continued to dance above the neck of the mold. We noticed that each bell’s flame burned a slightly different color and intensity. The pouring process was different for each bell; some splashed angrily while others accepted the liquid evenly, thirsty to please the bell maker. 6. All around the foundry we saw bells in various states of completion. A bell fresh from its mold looks like this, but after shaving and polishing, it will glow like a new penny. Their sound is somewhat golden too. Here’s Father Roman playing a “Welcome” peal on a set of the foundry’s bells in the warehouse. 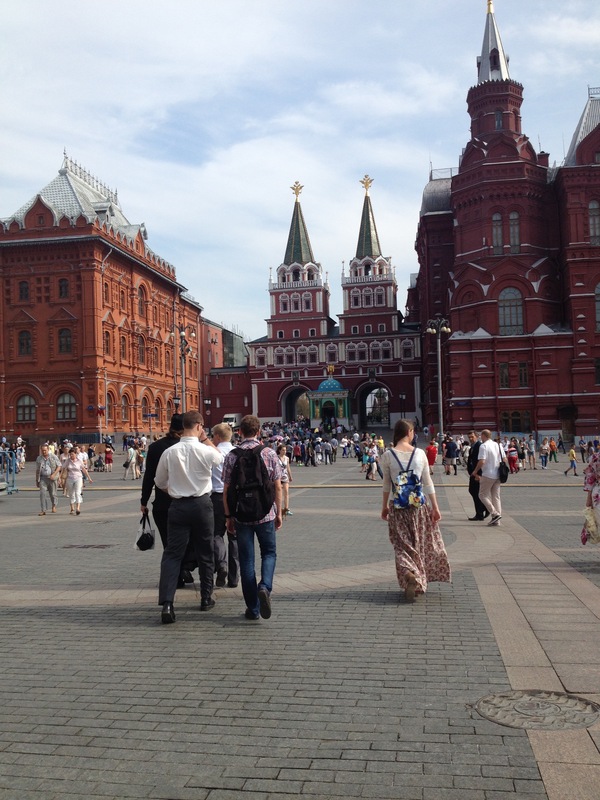 Red Square: home of the Kremlin, St. Basil’s Cathedral, the GUM department store, Lenin’s tomb, and Putin. 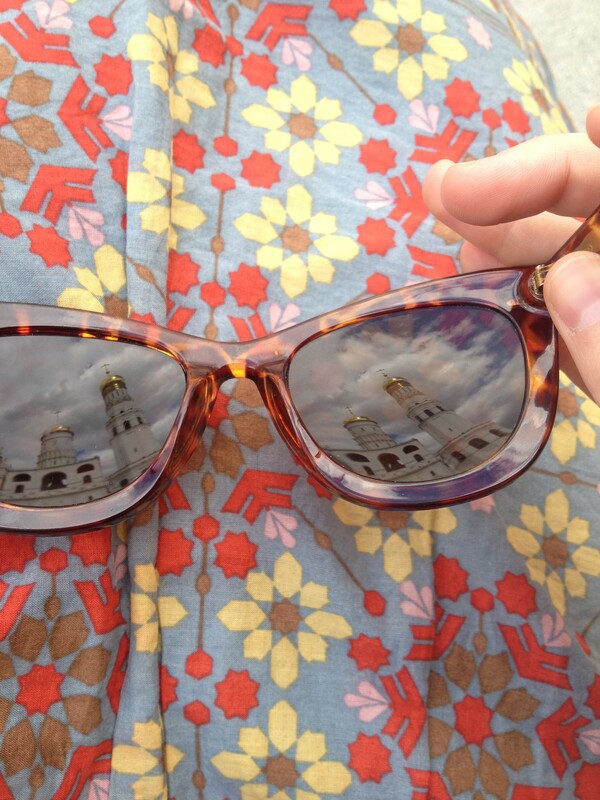 But what concerned us most was the bell tower of the Kazan Cathedreal. 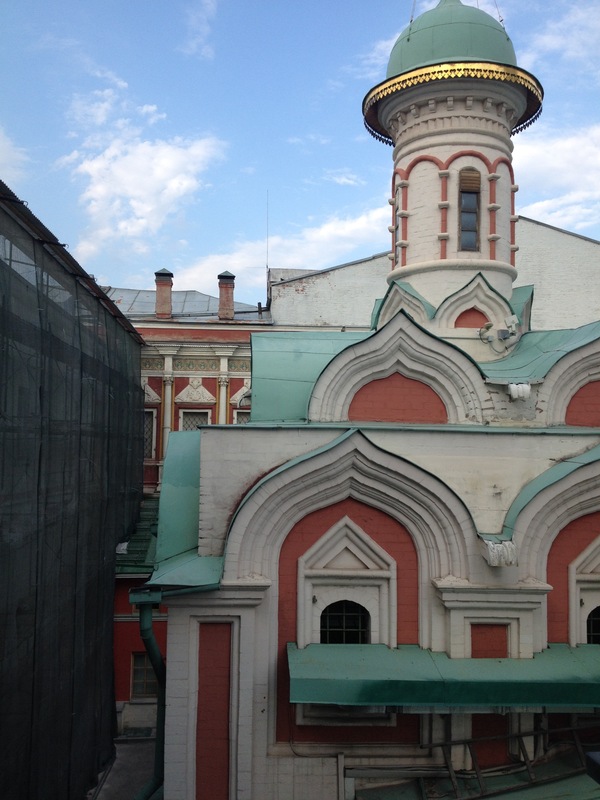 Below are two pictures taken from the that tower where we had a good view of the Cathedral itself as well as the northeast corner of Red Square. We got to hear the head bell ringer of Kazan Cathedral ring the conclusion of his 5pm peal and even got to try a bit of the ringing ourselves, before we were hushed by a monk who notified us that the 5pm service had already started. We were perhaps a bit too eager to make ourselves heard. Below you can listen to the tail end of the official Kazan peal! 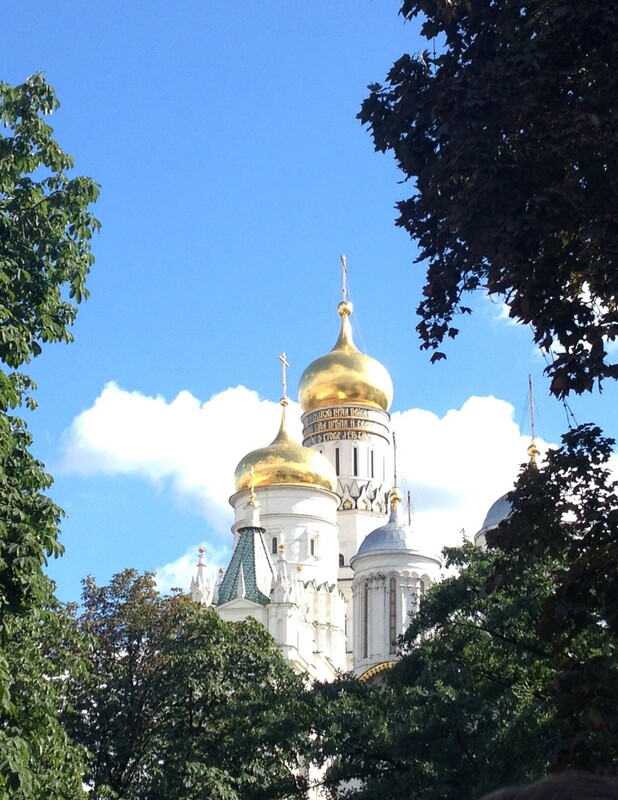 After a long journey across the Atlantic (and some jet lag) we arrived at the Danilov Monastery in Moscow! 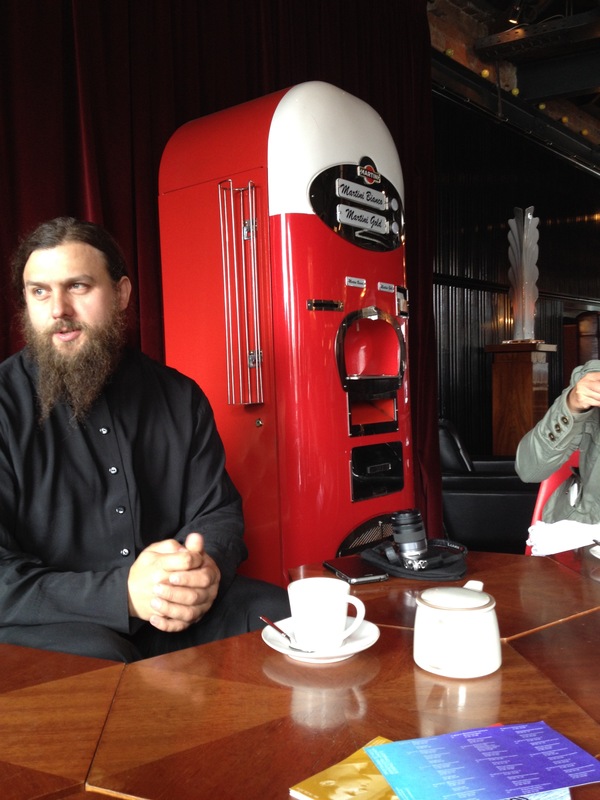 That first night we had dinner in the monastery refectory with Father Roman and then met the Father Superior Alexy for tea (and some very delicious consecrated honey). 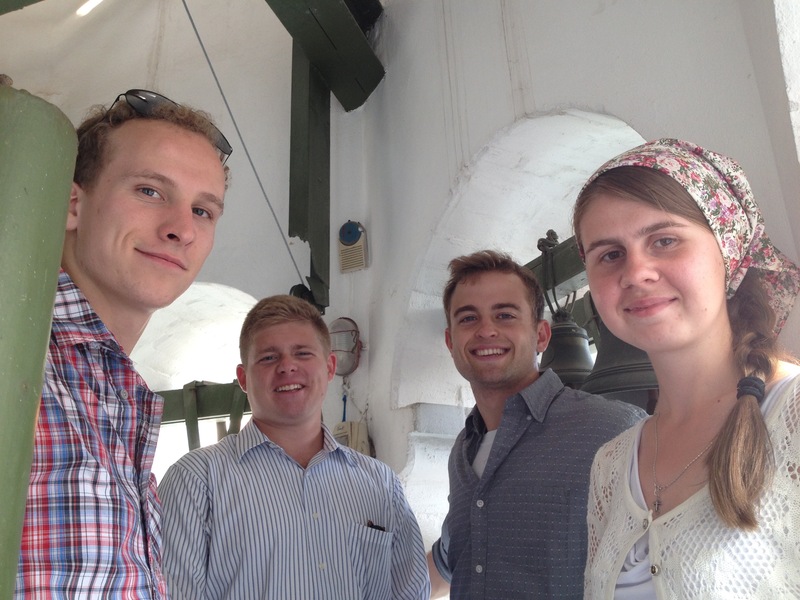 Here we are (except Jeffery, who is taking the picture) in front of the Danilov bell tower where the original bells hang. This tower is much closer to the ground than Lowell’s tower and more… well, pink. 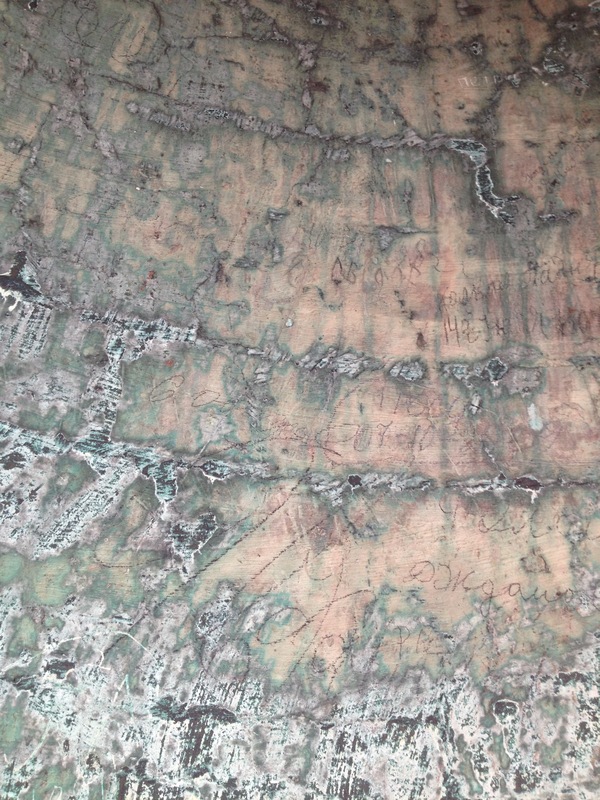 If you look closely at the inside of Mother Earth, you can see dozens of names carved into her underbelly. The tradition of carving one’s name into the inside of the bell started almost a century ago, in the 1930s, when Harvard bell ringers carved their names and class years. Up until 2008, this tradition continued (though Father Roman tells us that he wrote his name on the inside of the replica Mother Earth that now hangs in Lowell). We also saw different sets of indentations on the inner lip of Danilov’s Mother Earth; one pair of indentations where the clapper had hit the lip–back and forth–from 1907 until its transport to the U.S. in 1928, the deepest pair of indentations where the clapper had struck while hanging at Harvard, and the last pair where the clapper has struck the lip from 2008 until today. We got to participate in the 7pm ringing that evening. It was a feast day, and while a service was being conducted in the monastery itself, we gathered in the bell tower and listened to the sung vespers through the speakers in the bell tower. We were joined by members of Father Roman’s new bell-ringing class, and we got to partake in the initial descending peal, which was all timed very precisely with the progression of the prayers below. 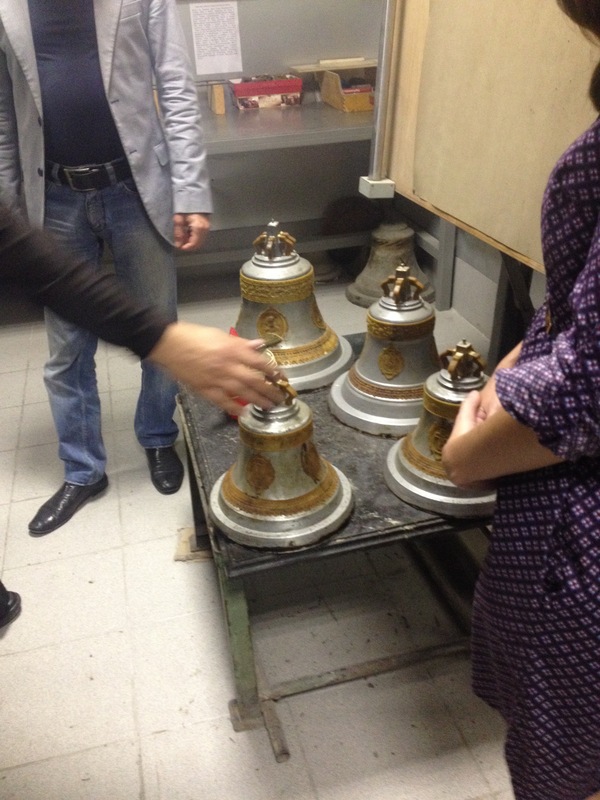 One by one we stomped or pulled strings attached to seven of the twenty-three bells that make up the Danilov set. Father Roman finished with a traditional peal for the occasion. Just as the harmonized voices concluded, a rain storm picked up all around the bell tower. We watched the lightening come closer and met the chilly wind with something like exhilaration. 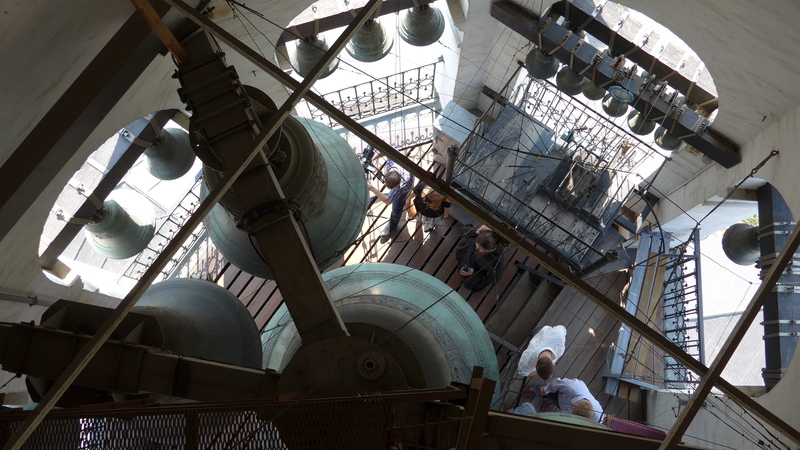 As the first drops hit our faces and the surfaces of the bells, we made our way down the tower to have yet another round of tea with other bell ringers. 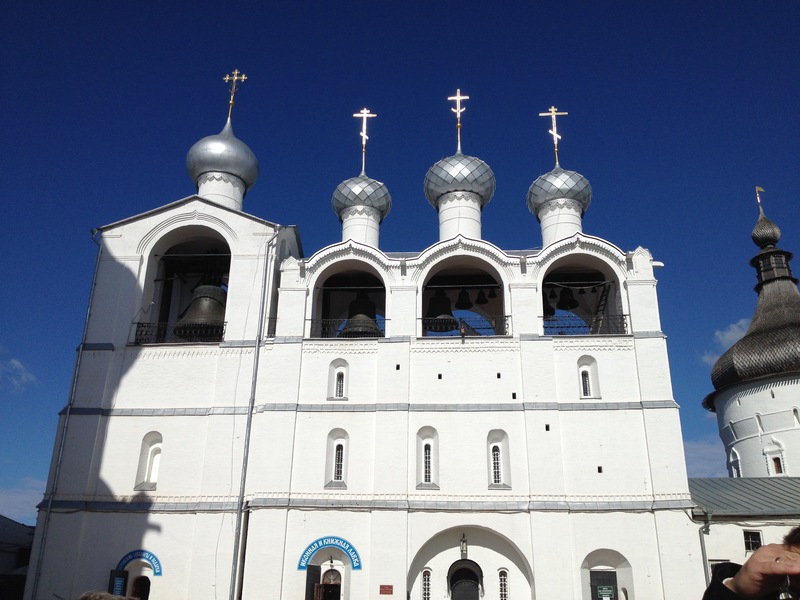 We are going to be visiting the original set of bells in the Danilov monastery in Moscow. The trip will be 10 days and we will learn lots of peals, travel around to bell foundries, and post here (hopefully) daily! We will try to make recordings and take photos so that the whole bell-ringing community can stay in touch. Want to hear what the original bells sound like? Take a listen below! Ginger Marshall, recent graduate, member of the bell ringers for 4 years. Ginger is making podcasts this summer for Houghton Library. Harry Hild, rising senior, member for 3 years. Harry writes for the Harvard Political Review. Todd Jones, rising senior, member for 2 years. Todd hails from Atlanta, Georgia. Jeffery Durand, rising junior, member for 1 year. Jeffery is a member of the Harvard Glee Club. Aaron Suduiko, rising junior, member for 1 year. Aaron studies the philosophy of video games.